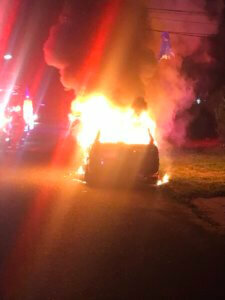 The Central Islip Fire Department was alerted to a reported car on fire in front of a home on Satinwood Street. On arrival, 1st Assistant Chief Patrick Murphy confirmed an fully involved auto fire to responding 1st due engine, Engine 372. 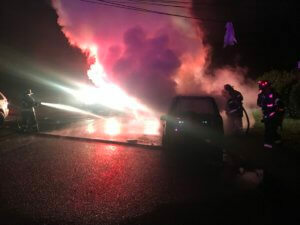 Once on location, the crew stretched an attack line and made quick work of the fire, which also extended to a second vehicle which was parked in close proximity. Engine 373 was second due to provide support and water to E372. All units returned to quarters shortly after the operation was complete.